Tough times reveal true character. And it took the senseless slaughter of nine souls at Charleston’s Emanuel AME Church by a deranged racist to force the great state of South Carolina to finally emancipate itself from Confederate ghosts. And so, too, with Charleston—a historic city that was chosen by Dylann Storm Roof as the place he would spark “a race war.” His plan backfired. Instead, he spurred a racial reconciliation 150 years in the making. Those folks who have long seen the Stars and Bars as a symbol of “heritage, not hate” were suddenly forced to recognize how the Confederate flag is seen through others’ eyes. And in less than a week, a culture-war debate that was deemed unassailable by generations of presidential candidates evaporated amid bipartisan support as the Confederate battle flag was banished from statehouse grounds. A deeper, more empathetic conversation has begun. And the families of the slain showed us the way. At Roof’s arraignment, they reminded us all of the essence of courageous faith: Love is stronger than hate. When hate is met with hate, the cancer compounds. But evil is weakened in the face of forgiveness and resolve. Cartoon evil has its uses. A glance through Roof’s rambling racist manifesto shows the corrosive effects of inherited hate on the human soul. The cold, calculated action of killing kind and welcoming people after watching them at Bible study made it impossible to reach for rationalizations. Good and evil were revealed, and no one else wanted to be on the wrong side of that divide. From the massive peaceful march on the Mount Pleasant Bridge to the packed rafters and overspill areas for this Sunday’s service at Emanuel AME, Charleston, the Holy City, chose the future over its past. More than that, the grieving and healing forces us to focus on the present—the gains we’ve made as well as the growing we’ve still got to do. That’s the spirit of Charleston today: civility and strength, diversity and decency—a recognition of the past but an unwillingness to be imprisoned by it. A new urgency is in the air, a recognition that old stereotypes no longer apply. Yes, Charleston is the city where the Civil War began with the firing on Fort Sumter. But South Carolina is now rated the most patriotic and friendliest state in the nation. The state that 1948’s segregationist Dixiecrat presidential candidate Strom Thurmond called home now fields, without much fanfare, the most diverse set of statewide elected officials in the nation, with Indian American Nikki Haley serving as governor and African-American Tim Scott serving in the U.S. Senate, both seats that Thurmond held during his too-long career. When we become too fixated on the past, it’s easy to lose our sense of perspective. After all, the Confederate battle flag was only added to the South Carolina state capitol dome in 1961—ostensibly to commemorate the centennial of the Civil War, but suspiciously coincident with “massive resistance” to desegregation and the civil rights movement. Conservatives in both parties initially enforced the status quo, creating a sense of political paralysis, aided by an unwillingness to confront contradictions between the rhetoric of liberty and the reality of tyranny exemplified by slavery. In more recent years, when Republicans ran for president, they were counseled by their local campaign operatives to sidestep any discomfort they might feel by pleading states’ rights. The flag was regarded as a settled issue, even by Governor Haley and Senator Scott. Then Dylann Roof’s violent neo-Confederate fantasies exploded and shattered the status quo. Amid shock and outrage, political calculations quickly shifted. Suddenly, the old defenders of flying the Confederate flag as a symbol of Southern pride could not be found on camera because articulating that position only added insult to injury. It meant effectively siding with Roof over his victims at Emanuel AME. For this moment to be meaningful, the momentum will have to be sustained. South Carolina requires a two-thirds vote of the state legislature to remove the Confederate flag from state grounds, as Haley requested Monday. But I look forward to counting the votes on this particular bill. Later the same day, the speaker of the Mississippi House said the Confederate symbol in his state flag needs to be removed—a decade and change after a popular referendum to do so failed. Not to be left out of the great awakening, Wal-Mart announced it would stop selling the Confederate flag in all its stores, effective immediately. The scars from America’s original sin of slavery will not, of course, be magically healed by the dispatch of the Confederate flag from statehouse grounds to a museum. 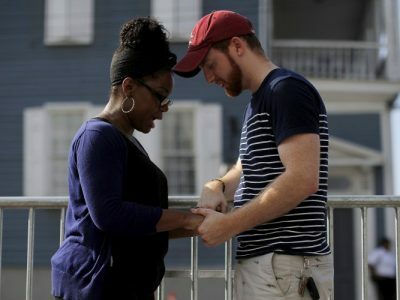 But we can all learn a lesson from South Carolinians’ response to this massacre. Because when the Holy City was assaulted by evil, they chose to turn their emotions into an occasion for unity and empathy, armed with the understanding that we can honor our history without being imprisoned by it. That is the spirit of Charleston.